Edimax has been bugging me to look at its CV-7438nDM N600 Universal Dual-Band Wi-Fi Entertainment Bridge. Since I didn't have any other N600 bridges in the Charts, I decided to also call in NETGEAR's WNCE3001 Universal N600 WiFi Adapter so that we would have something to compare against. Remember, an N600 bridge has a maximum link rate of 300 Mbps in either band. Adapters and bridges never operate simultaneously in both bands. To kick things off, how about a comparison of key features? The Edimax has a few features that the NETGEAR doesn't, namely Airplay support via an audio out jack to connect powered speakers and two switched ports. It's odd that one is 10/100 Mbps and the other Gigabit, but that's what they are. The NETGEAR doesn't do any tricks other than be a wireless bridge and it has only one 10/100 Mbps Ethernet port. Neither device can function as an access point or wireless repeater / extender. The Edimax' control features are shown in the callout diagram below. 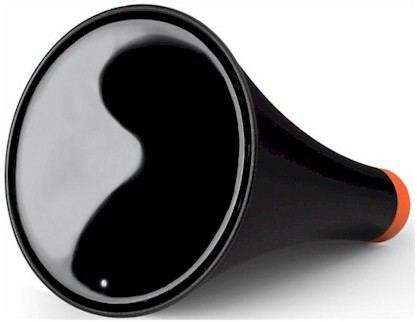 There's a lone status LED on the front of cone that communicates via color and blinking. The NETGEAR takes a similar approach to communicating status via its lone LED. I have to comment on the odd format of both these products. The Edimax' design leads you to believe that there is some special Wi-Fi signal gathering being done by its reflector-dish style front. But there are only two normal patch antennas behind it, which you'll see when we look inside. At least, however, the design intuitively guides you to orient the antennas properly by pointing the "reflector dish" toward the router you are connecting to. 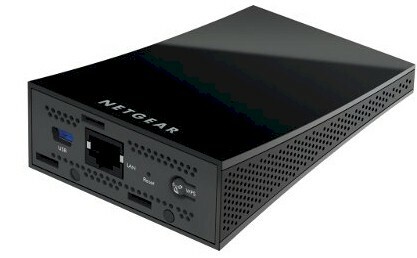 In contrast, the NETGEAR's design was initially a head-scratcher, since its connectors are on the surface it would stand on. But my confusion was cleared once I realized that NETGEAR includes both a wall-mount sticky pad and desk-mount stand.